GUEST AUTHOR: Asma Q. Fischer M.D. What is mindful? The word “mind “could be laden with a wealth of meanings. ~ It is the field where the brain and the heart meet and agree to get along. ~ It is where the senses allow the hearing, vision and touch to override the tongue. ~It is where the intellect and intuition join hands to walk in peace towards a single goal. ~ It is the field where they meet and bow their heads to the Divine and accept who they are, where they are and accept who else is in the field. ~It is where they they silently vow to honor the rights of all living beings and inanimate objects alike. Wear comfortable non descript clothes. Avoid clothes that take your attention away from the walk. Thus we have provided Tee Shirts in various colors so it is not a dictated uniform and yet it doesn’t single anyone out as being ostentatious. Wear comfortable shoes. Begin your walk in silence allowing your hearing, seeing and touch senses to override your tongue. Allow gratitude to seep into you as your walk the path. Try to stay silent at least for the first 30 minutes unless there is an emergency. Do not disturb others, nor react to them if disturbed. 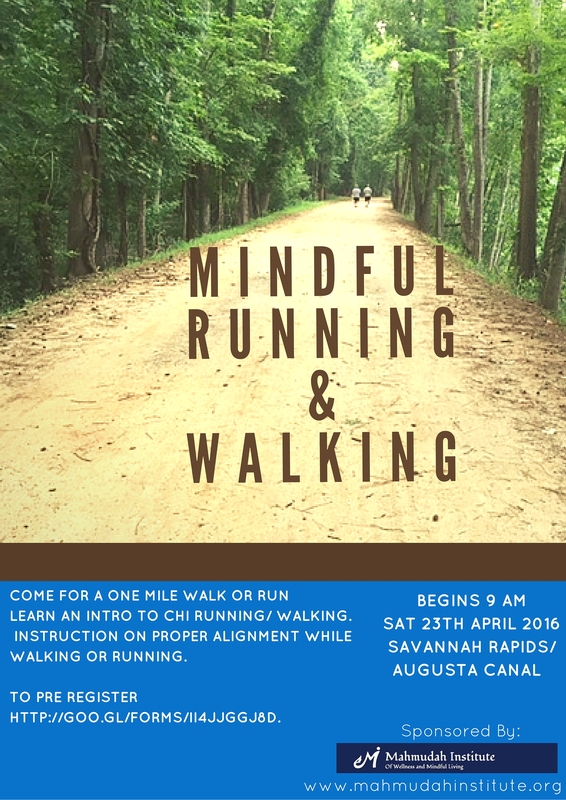 This mindful walk is for you; each one of you can best savor it in silence with all other senses ready to receive. Allow the river of thoughts to come and go like the ripples in the canal and the river that you see on either side of the path. Will use these tips in my walks here in San Francisco and try to be more mindful! Jazak Allah Khair for sharing this.